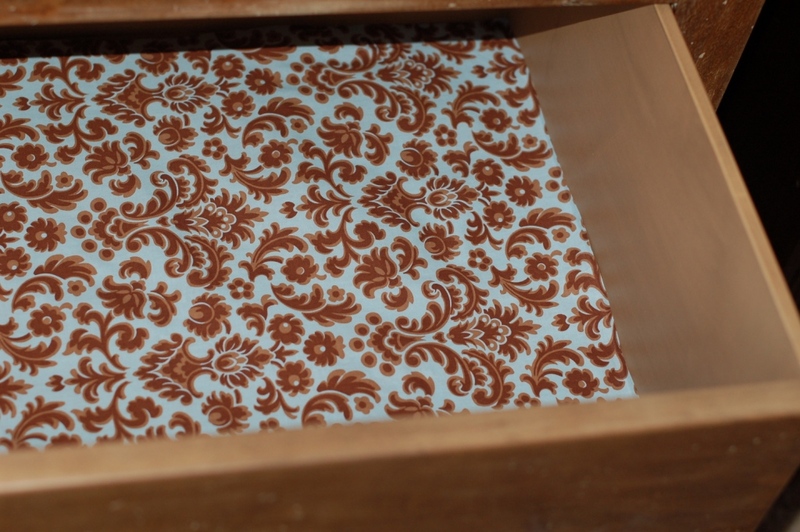 The fabric drawer liner project is complete! I stopped by the fabric store on Saturday and picked up some fabric at 30% off and they also had the fabric stiffner. I cut the fabric into four smaller pieces. I used a large mixing bowl to dilute the fabric stiffner. Don’t follow the directions on the bottle! Follow the directions from the blog link on BlueEyedYonder. She recommended diluting the stiffner much more than the directions on the bottle and this is important. You only need the fabric to be slightly stiff. If you use too much of the product the fabric is very difficult to iron flat and it is just too stiff. The picture above is the finished product! Now that I have the drawers lined, I needed to move my clothes from my old dresser to the new one. I don’t have as much space in the new one so I needed to consolidate and eliminate. I really think you have to be in the right mind set to eliminate. I am on a mission to get rid of clutter and things I don’t use so bit by bit, I am getting there. My inspiration for this project is from my friend Laura. Laura is one of the few people that may be more organized than me!! It is a sickness really but it works for me. Laura sent me a few pictures of the way she organizes her dresser drawers by rolling everything instead of stacking. I had always previously used the stacking method but when you stack, you can’t see what is underneath. 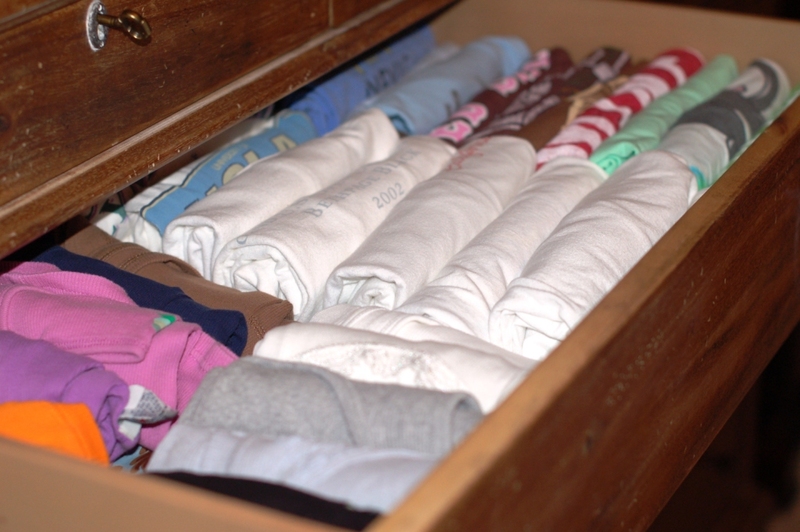 With the ‘rolling’ technique, you can see everything in the drawer clearly and things just slide in and out without disturbing the entire stack. As you can see in this picture, I have rolled my T-shirts in two rows on the right and then the two smaller rows on the left are my tank tops and camisoles. Why didn’t I think of this sooner!? I am loving my new drawer liners and my new organized drawers. Tomorrow I head to the Abba House thrift store to drop off my donations. I am so impressed. You must take after your Mother!